Courtesy of TheSportsGameGuy.com, Inside X-Box's Tina Wood visits with NCAA Football developer Ben Haumiller and former Product Manager Kendall Boyd to learn about the basics of NCAA Football 11. The interview was recorded no earlier than late March. Hey NCAA Nation, I'm Anthony White, Assistant Designer on the Central Football team, and I'm here to bring you a series of blogs about the new offensive styles in NCAA Football 11. The term spread offense is an umbrella term that encompasses a number of offensive systems. Offensive systems such as the Run and Shoot, Air Raid, One Back, even the Flexbone Triple Option are often identified as being a type of spread offense. For the sake of this blog post I'm going to identify the spread offense as an offensive system that's primarily run from the shotgun, spreads the field with multiple receiver sets, and can be used to both run and pass the ball with equal success. From the NCAA Football 11 official website. College football fans, get ready for your first taste of NCAA Football 11. X-box 360 users, the demo will be available June 14, for those on PlayStation 3, June 15. 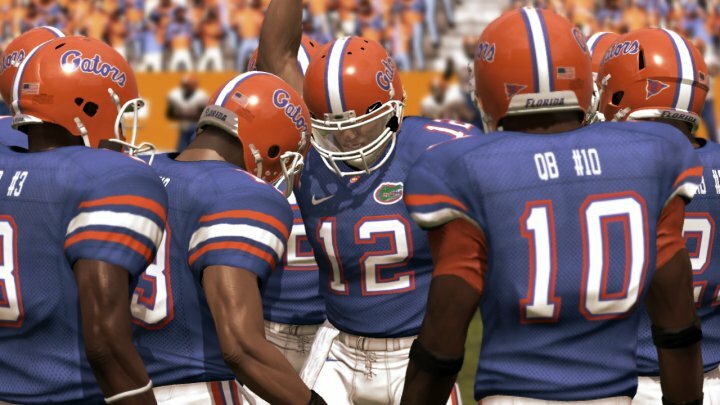 The official NCAA 11 Facebook page has released 28 new screen shots for the game. Iowa fans rejoice! Black facemasks! A new video from NCAA Football developers Russ Kiniry and Ben Haumiller breaks down some of the previously announced features coming to the game. The six-minute video allows Russ & Ben to share some personal thoughts on these items not only as developers, but also fans of college football and the game. Among the topics discussed are presentation, 120 Ways to Win & Real Assignment AI, and Locomotion. The second of three NCAA Football 11 Dynasty blogs discusses Prospects within Recruiting. Russ Kiniry (NCAA Football 11 Designer) back again and as promised, here is part 2 of the Dynasty Blogs for NCAA Football 11; you can check out the first one about our new Phone Call here. But before we get into the details of the second blog, I'd like to mention one more thing about the New Phone Call that can help you in a call. We were going to reveal this later but there have been a lot of good discussions at various community sites and we want to ensure everyone has all the new information for our new Phone Calls. During a call, when you are between topics, there is a chance you can earn what we call a Coaches Choice. This gives you the option to select the next topic and leverage your program's strengths. Hey NCAA Fans! Russ here and I'm back to discuss a crowd favorite. We are now less than two months away from the July 13th release of NCAA Football 11. Personally, I'm very excited about all the details we already talked about with game play and presentation. The game is looking really good right now and the team is working hard to finish in these last couple months. NCAA Football Associate Designer Larry Richart has just posted a blog discussing some of the changes associated around the Quarterback in NCAA Football 11. These changes include a Gameplanning setting to allow you to set your defenders to aggressively attack a scrambling QB as well as changes to the throwing motion during a sack animation. Hey there NCAA Football fans, Larry Richart here, Associate Designer on NCAA® Football 11, to fill you in on some more gameplay improvements. As you know, the spring football season has come and gone and the fall season will be here before you know it! In our previous blogs we have talked about the new locomotion system and the all-new Real Assignment AI. We haven't stopped there as we are continuing to work hard on making this the best NCAA Football title yet. Today, EA Sports announced Online Pass, an initiative to help encourage gamers to buy the game new while giving the company a way to make money off of used game sales. Currently, they receive nothing from sales of used titles. In 2008, 23% of GameStop's total annual revenue came from used software and hardware sales (over $2 billion), and used sales accounted for 48% of their total profit ($974.5 million). [Source] For comparison's sake, EA Sports reported net annual revenue of $4.2 billion in fiscal year 2008 and a $1.08 billion loss. Needless to say, any revenue from used game sales would be huge for the company. This year, EA Sports has made some dramatic changes to how offensive linemen select their blocking targets. While some defenders may have went unblocked in NCAA 10, this year they are picked up and perhaps even double teamed. 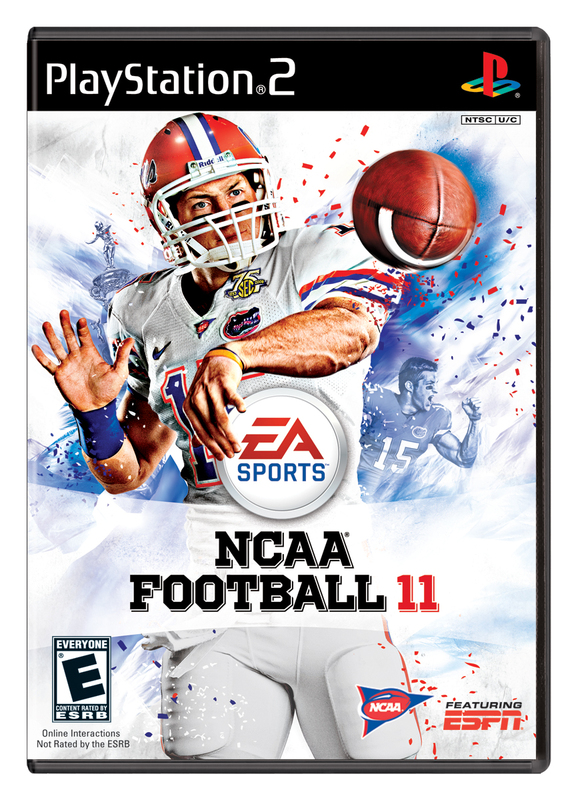 Courtesy EA Sports: Former University of Florida quarterback Tim Tebow will be featured on the cover of EA SPORTS NCAA Football 11, available July 13th. Associate Designer Larry Richart has posted a new blog at the NCAA Football 11 website discussing a new momentum-based locomotion engine coming to the game.